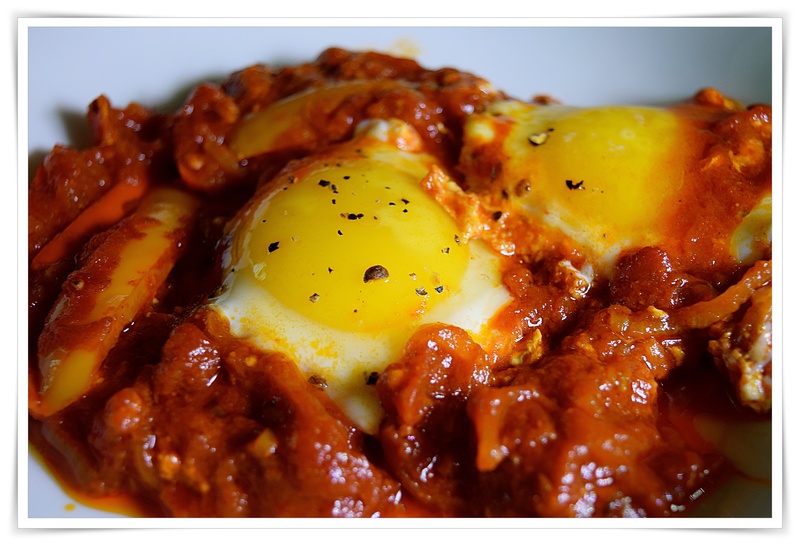 This week the cooking club is once again focusing on eggs, how appropriate for Easter week and with a new chef in town, Hugh Fearnley-Whittingstill and a recipe that I had flagged in the book for a nice easy brunch or dinner, chachouka a quick tomato and pepper stew an eggs in purgatory-ish kind of dish. Easy enough and served with crusty grilled or toasted bread, perfect for a spring egg dinner…I have plenty of happy chicken eggs so this will be a great one dish meal to enjoy on the porch on this beautiful spring day. I had those lovely small red, yellow and orange sweet peppers instead of regular bell peppers and instead of sautéing the onions first I sautéed the peppers first until almost soft then tossed in the onions just my preference…I served thick slices of grilled bread rubbed with garlic cloves while the bread was still hot, but maybe a nice warm stack of some kind of flat breads would be great to soup up the “stew”…all in all very nice and certainly a keeper recipe link below for Hugh’s original recipe. Heat olive oil in a large, preferably ovenproof, frying pan over medium heat. Add cumin seeds and the saffron threads and let them fry gently for a couple of minutes. Add the onion and cook gently for 8 to 10 minutes, or until soft and golden. Add the garlic and peppers and continue to cook over low heat for at least 20 minutes, stirring often, until the peppers are soft and wilted. Toss in the paprika then add the tomatoes with their juice and some salt and pepper. Cook gently, stirring from time to time, for 10 to 15 minutes. Preheat the oven to 350º, taste the mixture and adjust the seasoning if necessary. If your frying pan isn’t ovenproof, transfer the mixture to a baking dish. Make 4 hollows in the surface and carefully break an egg into each one. Sprinkle with salt and pepper. Bake for 10 to 12 minutes, until the egg white is set and the yolk still runny. Fearnley-Whittingstall, Hugh (2013-05-14). River Cottage Veg: 200 Inspired Vegetable Recipes (Kindle Locations 192-210). Potter/TenSpeed/Harmony. Kindle Edition.